Idaho is what we’d call semi-warm to gambling entertainment. They haven’t outlawed it 100%, but they haven’t allowed for much of a selection either. While many forms of gambling are prohibited, there are however certain exceptions. Poker unfortunately is not one of those exceptions. In fact, Idaho gambling law specifically mentions poker as a form of prohibited gambling. 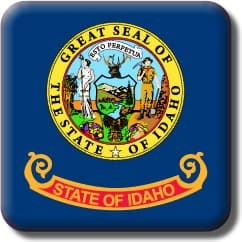 Under Idaho law, gambling refers to the risking of money, deposit, credit or anything of value for gain contingent wholly or partly upon chance, lot, the occurrence or result of an event including a sports event, the operation of a gambling device or casino gambling including but not limited to craps, blackjack, poker, roulette, baccarat or keno. There is no direct reference to the internet or online gambling but Idaho constitution prohibits the use of any electronic or electromechanical stimulation or imitation of casino gambling. It is currently not legal to operate an online gambling site within the state of Idaho. This being the case, players are wise to limit their participation in online gambling to sites which are legally licensed and regulated outside of the US within governing jurisdictions that have specifically legalized online gambling. There are multiple legally licensed and regulated gambling sites which welcome players from Idaho, and they are often referred to as Idaho online gambling options though they are not based in Idaho. These options include Idaho online casinos, poker rooms, sportsbooks accepting Idaho players. Compared to other states, Idaho gambling law has fewer penalties for operating an illegal gambling business. Engaging as a player in an illegal gambling activity is a misdemeanor offense. Idaho gambling law provides an exception for certain forms of social gambling but social poker games are not included in the exception. Home poker games are illegal in Idaho even if the host does not charge a fee or rake the pot. Online poker is not addressed by Idaho gambling law. In fact there is no law that specifically prohibits or permits online poker. Clearly the state is not very gambling friendly, which is why many poker players opt for legal Idaho online poker sites for playing poker. You will find a few of these sites listed in our guide. The poker rooms which are listed on this site have been through an extensive review process to ensure that they are legally licensed and compliance certified by a respected governing jurisdiction which has legalized online poker in their respective territories. We also verify the site’s security profile, and quality regarding a consistent, reliable and safe user interface performance. A safe and reliable gambling environment is critical if you intend to play poker online. Gambling was not always illegal in the state. Way back in 1890 when Idaho became a state, the law permitted gambling as long as it was approved by the locals. Many communities at that time approved gambling. During the late 1800s and the early 1900s there were many towns in Idaho that offered various gambling options. The state had many casinos. Some of them attracted famous celebrities and businessmen. However things changed in 1949 when gambling was made illegal in the state. Slot machines and some other forms of gambling continued to be legal until 1953 when the voters in the state voted to outlaw them. Pari-mutuel wagering on horse races were legalized in 1963. This was later followed by the legalization of charitable gambling by non-profit organizations. The Idaho lottery was established in 1986. However it was challenged in the Supreme Court and the lottery was closed down. Two years later the voters in the state voted to re-establish the lottery and by 1989 the lottery was once again running. The 1990s saw the creation of Indian casinos. However these weren’t full fledged casinos like in other states. These were essentially high stake bingo halls. The state refused to negotiate with the Indian tribes. In protest one of the tribes, the Coeur d’Alene tribe started a telephone and online national lottery. They had to subsequently stop the lottery as it did not make a profit and also because they faced numerous lawsuits. But their efforts did not go in vain. The Indian tribes were allowed to install electronic pull-tab on the basis that they are similar to the lottery. The legal age for gambling in Idaho is 18. Bingo and raffles are legal as part of charitable gambling. The organization conducting the event must obtain a license to conduct the event. These are restrictions on the prizes, participation or entry gee and age of participants. Idaho bingo fans do have the option of participating in legal Idaho bingo halls that are licensed, regulated and located outside of the US within jurisdictions which have specifically legalized online bingo gaming. Today there are seven casinos in the state along with nine horse tracks. None of these casinos offer poker or card rooms. Casinos operating in Idaho must comply with the state restrictions on the games that can be offered. One can play video poker, slots and other casino games at these casinos. Off track horse betting and other forms of wagering are also offered by these casinos. Indian casinos are exempt from the law that makes it a crime to possess a slot machine in Idaho, unless it’s from before 1950 and non-electronic. The legal age for gambling in Idaho is 18. The Unlawful Internet Gambling Enforcement Act of 2006 does not apply to those who engage in online gambling or poker as mere players. It does not make online gambling or poker illegal. Rather it prohibits the processing of payments received from an online gambling activity. In 2011 when the Department of Justice ruled that the Federal Wire Act applies only to sports betting and not online gambling or online poker, the state lottery director went on record saying that land based gambling was the first priority for the state and there were no plans of regulating online poker. For those who prefer to review the laws and statutes for Idaho in their original context and language, you can visit the State of Idaho Legislature where you will have access to the law of the state in their entirety. **For those who are looking for a professional legal interpretation of any law or statute, we recommend that you contact a licensed attorney. This page is intended to serve as informational only and is not intended to substitute for or provide any type of legal services or advise of any kind. We are not lawyers and are not qualified to provide professional legal interpretations or legal services of any nature. Where does Idaho stand on gambling? While there isn’t much a selection within the state of Idaho, they also haven’t gone out of their way to outlaw it totally like in some states. Most traditional gambling practices are still forbidden but there are horse and dog tracks throughout the state that practice a form of gambling that is widely legal throughout the United States with only few exceptions. What is Pari-Mutual gambling and does Idaho allow it? Pari-Mutuel gambling is legal within the state of Idaho and is the most popular form of gambling at horse and dog tracks. This form of gambling has all of the gamblers make their bets to a pot where the facility only takes a small fee. All of the bettors who placed bets on the first three winners of the race split the pot according to the stakes of the race and the bets that they placed. All of the patrons are placing bets against other patrons and not the establishment itself. What is social gambling and does Idaho allow it? Social gambling is one of the other forms of gambling within most states in the US that is typically allowed. In Idaho, it is not legal. A social gambling game isn’t just a simple game of poker between friends in a private dwelling. The card game itself is totally legal until there are real bets and real money being wagered. That is the point where it becomes illegal. What are the penalties for gambling in the state of Idaho? If you are caught practicing any of the illegal forms of gambling in Idaho you will be given a “simple gambling charge” which is a misdemeanor. A misdemeanor in the state of Idaho can lead to a jail sentence that does not exceed 6 months and a fine of up to 1000 dollars. If you are caught multiple times for simple gambling the charge goes to a “aggravated gambling” charge and those penalties can double. Has Idaho always been primarily against gambling? No, in fact, when Idaho became a state most state residents approved of gambling. There was numerous casinos and gambling facilities in the towns all over the state until the mid-1900’s when gambling was outlawed. Pari-mutuel gambling came back in the 60’s and there was a lottery that made its way back into Idaho culture in the 80’s. Are there any gambling establishments that are still open in the state? There are horse and dog tracks all over the states and currently there are 7 casinos although none of them can offer poker or card rooms. They do have options available for slots, video poker, and various other casino games that fall in suit with the legal code of the state. There is also a unique law in Idaho where slots can be purchased under some legal compromises if the slot is from before 1950 and is non-electric creating an interesting old school vibe to some of the slot machines you can find in the state. What’s the gambling age in Idaho? The legal age to gamble in Idaho is 18.